During morning Mass at the Casa Santa Marta, Pope Francis urges lay people and pastors to reflect on what it means to be Christian, calling on them to be "open" to God's surprises, drawing close to those in need. An invitation to be " earnest Christians ", Christians who "are not afraid to get their hands dirty, their clothes, when they draw near", Christians "open to surprises" and who, like Jesus, "pay for others" . 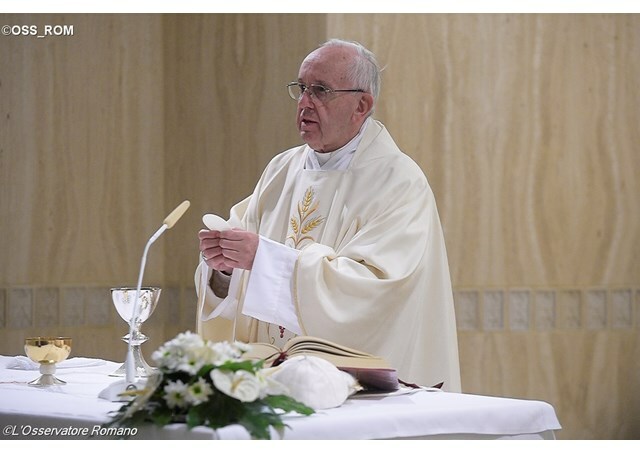 Those were Pope Francis’ words during his homily at the morning Mass at the Casa Santa Marta. Taking inspiration from today's Gospel from Luke, the Pontiff reflected on the "six characters" of the parable told by Jesus to the Doctor of the Law who, to put him "to the test", asks him: "Who is my neighbour?". Then he lists the bandits, the wounded, the priest, the Levite, the Samaritan and the innkeeper. He did not look at his watch, did not think about blood. "He came close to him - he got off his donkey - he tied his wounds, pouring oil and wine". He got his hands dirty, got his clothes dirty. "Then he loaded him on his mount, took him to a hotel", all dirty ... blood ... And so he had to get there. "And he took care of him". He did not say: "But, I’ll leave him here, call the doctors who’ll come. I'm leaving, I've done my part. " No. "He took care", saying: "Now you are mine, not for a possession, but to serve you". He was not an official, he was a man with a heart, a man with an open heart. The Pope then speaks of the innkeeper who "was stunned" to see a "foreigner", a "pagan - so we say - because he was not of the people of Israel" who stopped to rescue the man, paying "two denari" and promising to pay any expenses on his return. The innkeeper does not doubt that he will receive what is owed, adds Pope Francis, it is the reaction of one who lives a testimony, one open to the surprises of God, just like the Samaritan. Both were not officials. "Are you a Christian? Are you Christian? ". "Yes yes yes, I go on Sundays to Mass and I try to do the right thing ... less talk, because I always like to talk, but the rest I do well". Are you open? Are you open to God's surprises or are you a Christian official, closed? "I do this, I go to Mass on Sunday, Communion, Confession once a year, this, this ... I am up standing". These are the Christian officials, those who are not open to the surprises of God, those who know so much about God but do not meet God. Those who never enter into amazement before a testimony. On the contrary: they are incapable of giving witness. The Pope, therefore, urges everyone, "laymen and pastors", to ask ourselves if we are Christians open to what the Lord gives us "every day", "to the surprises of God that often, like this Samaritan, makes things difficult for us", or are we a Christian official, doing what we have to, feeling that we abide by "the rules" and then being constrained by the same rules. Some ancient theologians, Pope Francis recalled, said that in this passage "the whole Gospel" is contained. Each of us is the man there, wounded, and the Samaritan is Jesus. And he healed our wounds. He drew near to us. He took care of us. He paid for us. And he said to his Church: "But if you need more, you pay, I will come back and I will pay". Think about this: in this passage there is the whole Gospel.